I can’t believe the Holidays are coming to a close and soon we’ll be entering 2019. Whoosh! This year seemed to fly once October came. We can still hold on to Christmas a little longer though, thanks to today’s home tour coming from Monika Abts (Moni) in Odenthal, Germany which is about 20 minutes from Cologne. She shares her 200m² home with her husband, two children (boy 14, girl 11) and her dog, Liz. She’s a textile engineer by day, but also writes a blog called Lady Stil, which focuses on interiors and DIY projects. You can also find Monika on Instagram @lady_stil, where I first discovered her home. I hope that you find some inspiration here, there are so many decorating ideas in this home tour, you may find something that sparks your creativity and gives you a new project idea at home. 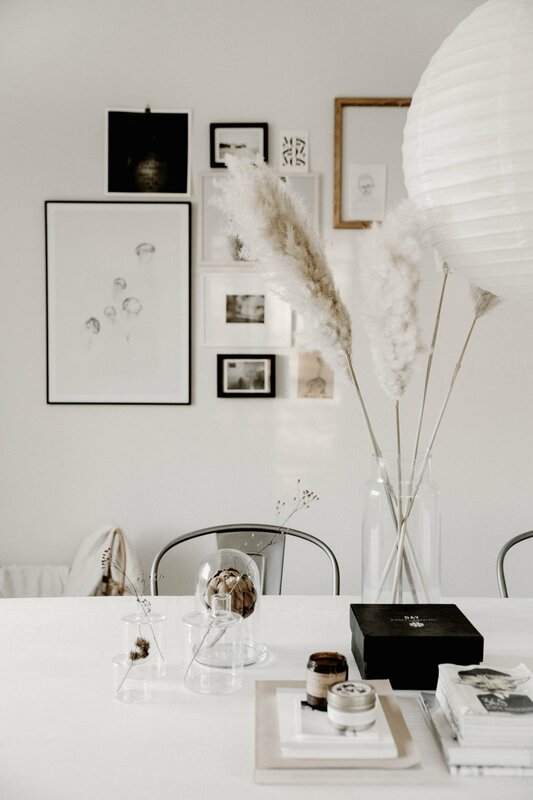 I like the dried flowers in the glass vase on the floor, the giant wreath hanging above her dining table, her many throw rugs because they are very natural looking, and black bulbs hung over her window in the bedroom. In fact, that is one idea I’d like to try in my wintergarten since I already have the bulbs from Granit, still in a box! Here is her home, and below, an interview that I had with Monika about her style, what’s on her playlist, and more! Enjoy! I’m not stuck to a special house or a place. Home is where beloved things and people are and where I can be myself. I could never decide on a particular style and so I like to mix them together. My interior hast o be individual and reflects my personality. That´s why it changes more often within a year. What always stays ist the natural aspect and color scheme. I love the contrast between nordic and other cultures. I could never give up beautiful memorabilia, but I also love modern things. That is in a constant change due to lifestyle changes, feelings and how my taste changes over time. As for objects, at the moment I love my desk, which I built out of an old door and left the original hinges on. My kitchen! Definitely! A dream of mine is to have white kitchen fronts, but the manufacturer changed the hinges, so no chance until we can afford a completely new kitchen. I also thought about having a new floor in the kitchen/dining and entry. Some kind of resin floor. Being creative or just relaxing and cuddling with Liz (my dog). Lucky me, we all love pancakes! Sometimes we cook, but sometimes we also order something. It depends on how spontaneous the invitation is. But we always talk and laugh a lot until the next day… And we always look shocked when someone tells us the time! What is your dream piece for the home? I like houses which are well designed and when the interior matches, but that isn’t really important to me while visiting someone. It’s ultimately the people that I’m there for! Both! I love fresh flowers for the weekend, but I also love my cactus gang in the bathroom and upstairs on the windowsill. Neither! I don´t drink any alcohol. I’ve tried so many times and so many different things, but I don’t like the taste. I drink my Pina Colada without alcohol! I have BIG Amsterdam LOVE! They have the BEST interior shops for my style! love the Dutch way of life and the decor of their homes. That is very difficult for me, because I could list at least a hundred accounts which I adore and they all have so many different styles. If I had more than one house, each of them would have a different style. @tatjanas_world_ - I love the mix of rustic elements with bohemian accessories. 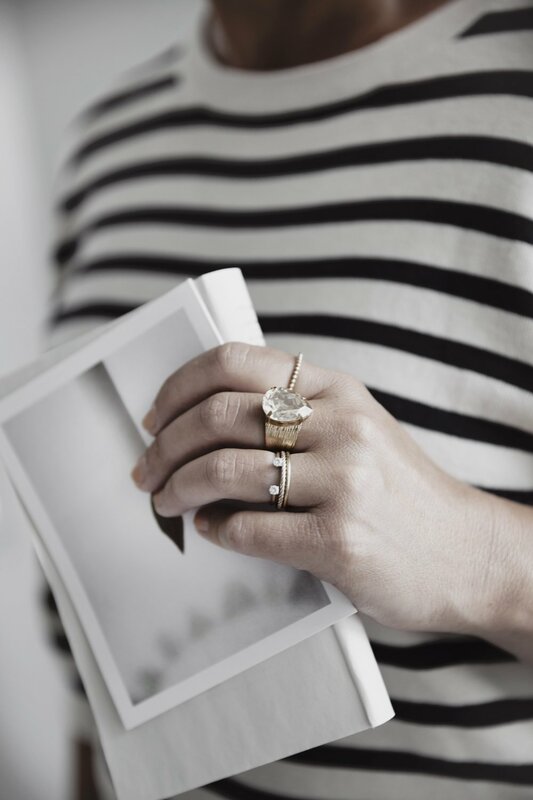 @skovbon - Kirsten’s style is black and white, a gorgeous mix of modern Boho and Nordic. @anitaeedelbloedt - I would change houses with her immediately. @tthese_beautiful_thingss - If I were a child I would like to live in one of Viktoria’s kidrooms! For my second and final post about The Martha Stewart Collection created for Macy’s, I’m sharing a few of my favorite things from her holiday collection around the theme of EATING. If you remember from Friday, my first post from the collection centered around SLEEP. Now that you’re awake, it’s time to eat, so below are 7 things for mostly the kitchen, and yes the wreath again because the second one I have is on the door and I wanted to show you how it looks, and - the bonus - 3 cookie recipes from Martha! 5/ Tree s+p shakers (Update: Sorry they just sold out). I hope that you have lovely plans lined up for the holidays. What will you do? My last day of work for this year will be this Thursday, then I’m off until 2 January. BUT, I have good news for you… I have home tours lined up from tomorrow until the first week of January, so I’ve scheduled them to all run while I’m away… If you want to see what I’m up to over the holidays, I’ll definitely be posting on my Instagram and Instagram Stories (@decor8), so please stay in touch with me there. I was so happy when Martha Stewart called! Well, ok she didn’t call, but her people did, and they asked me to create two posts to share some of my favorite things from The Martha Stewart Collection, created for Macy’s for Christmas. Best of all, they gave me so many options that I spent about half a day making my choice for themes and products and I decided on two core themes: Eating and Sleeping. That about sums up the week between Christmas and New Year’s Eve for most of us, right?!? This is my first post decided to Sleeping but with a twist, a Christmas-y bedroom that doesn’t scream Christmas, but instead is festive enough for now. When I shop, I always look for things that I can keep and enjoy so in January, I can keep everything on my bed except for the little hats pillow and the wreath above the bed, and then I have a look that is understated and clean. I can even fold back the quilt so you only see the stripes, and replace the shams with clean white ones, and create a wreath from fresh eucalyptus over my bed for January and pack this one from Martha away until next year. Here is my bedding from The Martha Stewart Collection, created for Macy’s. It’s only available for a very limited time, and the sales on these products right now are extremely good, so if you really want to buy something that you see then do it NOW because once it sells out, that’s it! You can also shop these things (and more!) at Macy’s store nearest to you. AND if you don’t live in North America, Macy’s ships overseas. I got my order within a week, and I’m in Germany! I also appreciated that their was no tax nightmare, things came directly to my door without a trip to the tax office to pick it up. love how Macy’s ships here now, it gives me a chance to have some more typical “American” things in my home that I don’t have access to but have missed. So now I have a funny little story to tell you about a small robber in my home. He appeared during my mini home photoshoot today. Do you know who it could be? Why yes, it was my little boy, who turns 5 in only two months (!!!). He came in while I was taking photos and jumped on the bed (such great timing and so much fun some days to work from home, NOT, #momlife) and he quickly grabbed the pillow with the little hats and ran off! The pillow thief! I called out to him, “Where did you take the pillow, Schatzie?”, and he replied, “You aren’t getting it back, I like it!’. So look carefully at the pillow on my bed below because it’s the last time anyone will see it there. It’s on HIS bed now. #$%*&! I actually really like it on his bed though AND I really like my room with only the faux fur pillow, it’s more me. Both pillows are cute, but my little boy likes nice things in his room so I can’t say no if he swipes my decor stuff. AND I do like my bed the “new” way below, too. I guess we both win. To see what else Martha Stewart has for bedding, you can view her entire collection HERE. I hope that you enjoyed my first post for Martha Stewart: SLEEPING! Next will be EATING and I’ll show you what I have to share with you next week on Monday. Have a lovely weekend, more home tours will be on the site Monday. I have 12 more home tours schedule for December, so stay tuned for almost a tour-a-day until New Year’s Eve!